What makes Celebrity Greens, USA-manufactured, Artificial Grass Turf superior to cheap Asian turf? Asian-manufactured turf may not be held to the same standards as turf manufactured in the USA. Celebrity Greens’ turf is tested in the USA for lead content and other dangerous materials. We follow stringent federal, state and local regulations regarding product content and heavy metal contaminants. Asian turf is tested in Asia. Just like toys, dog food, dog treats, etc., they may not be held to the same product content standards, and may result in turf that is not safe or environmentally friendly. CG turf is manufactured with either a high performance urethane backing or a 100% recyclable Duraflo E.E.B.S. backing. Some Asian turfs are manufactured with a latex or marine backing, that can give out in 1 to 5 years, causing product failure. 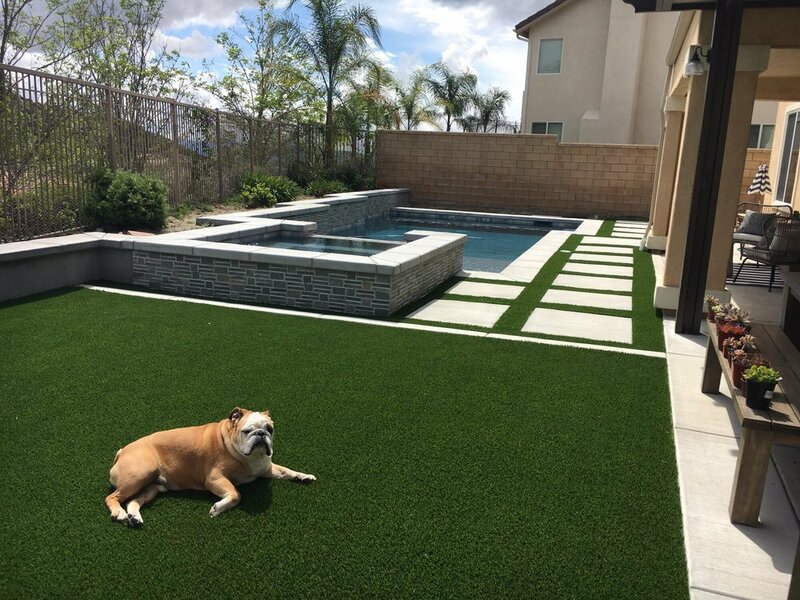 CG turf incorporates high-quality fibers that stand the test of time, allowing you to enjoy your artificial turf for years to come and is backed by the largest yarn suppliers in the world. Why take a risk with your investment & the safety of your family? In short, there are a multitude of compelling reasons to avoid buying Asian turf. China, as well as other Asian countries, may not enforce the same stringent manufacturing standards as we have here in the US. This makes it very difficult to know exactly what you are buying, how long it will last, whether your warranty will be enforceable, and whether it’s even safe for your family. 1. It’s difficult to know exactly what you are buying… I have seen thousands of turf samples over my 20+ year career in the turf installation industry. I have had reps in my office from just about every company in every country around the world. I have seen imported products that look pretty good in sample form but after 6 months of sitting in the warehouse, the backing begins to crack and deteriorate. The issue here is we don’t know the chemical makeup of the urethane compounds. In many cases, these backing systems are latex rubber compounds. American made manufacturers are quick to produce records of batch runs, chemical recipes, etc… to show things such as the UV inhibitors. These items are nearly impossible to get from an overseas manufacturer, especially if you are having an issue with their product. 2. How long will it last? If you don’t know exactly how it is made and what it is made of, you cannot even guess how long it will last. What I do know is that when a sample begins to fail after being indoors at my office for 6 months, it’s a safe bet that it will not last nearly as long without the commencement of failure after installation. 3. Is the warranty enforceable? In almost all of the warranty cases on overseas turf, you are reliant upon the importer to satisfy the claim. Unlike American manufacturers, an overseas turf company is not going to ship out one replacement roll to replace your lawn. Importers buy this turf by the carton full and are often taking advantage of special pricing. If your turf fades in two years, and the importer does not have any of your turf left, then you are likely out of luck. If you have a warranty claim on a product made in the US, you call the mill, they send you a roll. It’s that easy, and it should be. 4. You have no idea if the turf that was shipped from Asia is a factory second… or a third, has slight defects, or is a limited production. 5. You get what you pay for… Chinese turf is much cheaper, even after shipping half way across the world. The reasons it is cheaper are the same reasons not to buy it. China utilizes cheap labor, lower manufacturing standards, cheaper materials, and reduced specifications. 6. Just buy American… If you cannot afford to buy an American turf product, then you should not be buying turf. When you buy American made turf, you are employing Americans. This can cost much more to do than does employing Chinese workers in China. “Buy American” is not just a catch phrase… it really means something to the US workers in the mills, and to their families.